HandiFox inventory management handheld application extends QuickBooks Pro or Premier Packages to your warehouse, receiving dock, or cycle counts. Wireless handheld computers with barcode scanning capabilities improve accuracy and decrease time for inventory counting and purchase order receiving operations. Data is automatically posted to QuickBooks. HandiFox Sales is a full featured mobile sales system designed for QuickBooks users. Small and mid-size companies who use QuickBooks as their primary accounting software can now extend their sales and inventory control beyond the office. 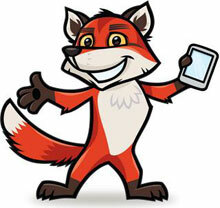 HandiFox Sales is a full featured mobile sales system designed for QuickBooks users. Small and mid-size companies who use QuickBooks as their primary accounting software can now extend their sales and inventory control beyond the office. HandiFox Sales can create sales orders, credit memos, and invoices. It can process payments, track inventory movement, print reports in the field. This means sales personnel can send orders in from the field, electronically. Compatible with QuickBooks Pro, Premier, Enterprise and Canada versions. This software is available bundled see (Part# HFOXSALESQBPRO-KIT) or (Part# HFOXSALESQBPREMIER-KIT). Software includes 60 days of free technical support from date of purchase. Additional annual support available. HandiFox Inventory Management, software only. This version does not include Sales Orders, Invoices, or Picking and Packing. These functions are available in the HandiFox Sales version. The HandiFox inventory management handheld application extends QuickBooks Pro, Premier, Enterprise and Canada Packages to your warehouse, receiving dock, or cycle counts. Wireless handheld computers with barcode scanning capabilities improve accuracy and decrease time for inventory counting and purchase order receiving operations. Data is automatically posted to QuickBooks. This software is available bundled with QuickBooks and hardware, see (Part# HFOXINVQBPRO-KIT) or (Part# HFOXINVQBPREMIER-KIT). Software includes 60 days of free technical support from date of purchase. Additional annual support available. Please call if you aren't sure what you need to order. HandiFox Sales software and hardware bundle. Order this part if you DO NOT already have QuickBooks. Since QuickBooks is REQUIRED, this bundle includes: HandiFox Sales Software, QuickBooks Pro, Mobile Computer with charging and USB communication cradle, 4GB microSD card, and one year of HandiFox software support. HandiFox Sales software and hardware bundle. Order this part if you DO NOT already have QuickBooks. Since QuickBooks is REQUIRED, this bundle includes: HandiFox Sales Software, QuickBooks Premier, Mobile Computer with charging and USB communication cradle, 4GB microSD card, and one year of HandiFox software support. HandiFox Inventory software and hardware bundle. Order this part if you DO NOT already have QuickBooks. Since QuickBooks is REQUIRED, this bundle includes: HandiFox Inventory Software, QuickBooks Pro, Mobile Computer with charging and USB communication cradle, 4GB microSD card, and one year of HandiFox software support. The BCI HFOX-SALES-KIT is also known as HFOX-SALES-KIT	or HFOXSALESKIT	.